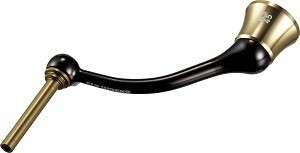 Shimano folding handle in light gunmetal color, with rubber T knob. 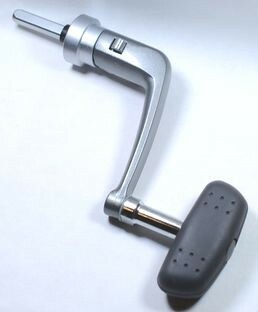 These handles were used on Shimano 05 BBX C3000 spin reels, and fits to spin reel in size 2000, 2500, C3000. Handle shaft is 4.5mm square, 24mm long. Knob is rivetted and may not be replaced. Solid machine-cut handle. Fits to Daiwa reels with no hex handle shaft, Exist, Steez, Certate, Bradia, '07- Luvias, Fuego and etc 1000-2004 size. Comes with 2 CRBB 4x7x2.5 ball bearings and washers. Fits with Daiwa S knobs. Solid machine-cut handle. Fits to Daiwa reels with no hex handle shaft, Exist, Steez, Certate, Bradia, '07- Luvias, Fuego and etc 1000-4000. Comes with 2 CRBB 4x7x2.5 ball bearings and washers. Fits with Daiwa S knobs. Solid machine-cut handle. Fits to Daiwa reels with no hex handle shaft, Exist, Steez, Certate, Bradia, '07- Luvias, Fuego and etc 2500-4000. Comes with 2 CRBB 4x7x2.5 ball bearings and washers. Fits with Daiwa S knobs. 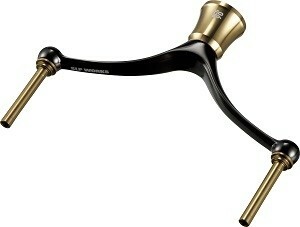 Solid machine-cut handle for smooth, powerful cranking. Fits to Daiwa reels with no hex handle shaft, Exist, Steez, Certate, Bradia, '07- Luvias, Fuego and etc 3500-4000. Please assemble with 2 ball bearings and a Daiwa S size knob.